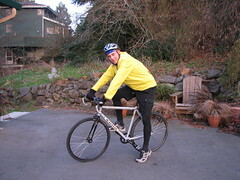 This past week I played broker for Bjorn as he bought a bike off of craigslist. Since the owner was in Tacoma, I got to play middleman. Prior to deliver to Lynden next weekend, I decided to take a test ride to Manchester, albeit 37 degrees. The bike is a very light single speed/fixed gear reversible hub, which means uphill pedaling is a bear and downhill becomes a coast ride (at least in single speed. I'm not sure what happens in fixed gear. Maybe you spread your legs and let the pedals spin!) It's great on the flats since the bike is so light. It would appear that the bike will work well for Bjorn in the flat Nooksack Valley, but it would be a killer for my hilly work commute.